In 1867, the Dean and Canons agreed to employ part of the sum they received from the Ecclesiastical Commissioners in compensation for the loss of their estates to establish a ‘Fabric Fund’. 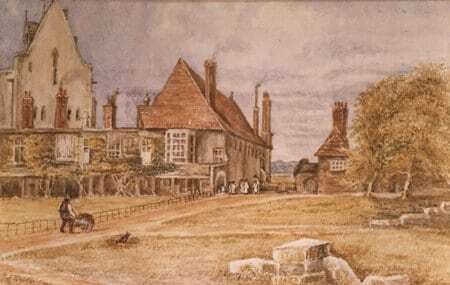 Their first project was to be the rebuilding of the Horseshoe Cloister, which was in a somewhat dilapidated state, as shown in this contemporary watercolour [SGC PH HO.30]. The aim was to improve living conditions and provide more space for residents, who included the Virger and the Lay Clerks. In 1867 Antony Salvin, who served as consulting architect to the Dean and Canons during the 1860s, was commissioned to prepare and submit plans and elevations for a “new build”. However, although these were ‘highly approved of’ by Chapter, according to the Chapter Clerk, Richard Cope, ‘the Cost was found too great and the Government (Lord Derby’s) were not able to obtain or feared to ask a Grant for a sum sufficient in all to warrant the Chapter in proceeding with the Work’ [SGC XVII.9.4]. The following year, George Gilbert Scott, who had been invited to Windsor to advise about the replacement of the steps leading to the west door of the Chapel was asked to give his opinion about the adjacent Horseshoe Cloister. At his instance some of the plaster was removed from the walls and it was discovered that the buildings, which had been constructed between 1478 and 1481, were half-timbered and in-filled with herring bone brickwork. Richard Cope reported that, on discovering this, ‘Mr. Scott proposed to restore instead of rebuilding and said the effect would be very good and the expense very much less. He at once employed his Clerks to make plans of the Building and had more plaster removed to permit of a further examination.’ Whilst preserving and reusing as much of the old material as he could, including timber and brickwork, Scott aimed to offer improvements to the internal living accommodation and to extend the Cloister eastwards whilst retaining the character of the original. Chapter accepted his plans. “4. The herringbone brickwork & old external walls being all new. This had I knew of it I should have strongly objected to. I believe it must have occurred when I was suffering from a long illness: anyhow I was never consulted on the subject … [Marginal note: ‘Messrs Poole foreman appeared to have said that to make new was cheaper than to repair’]. 5. The new oak timber in old external walls. A provided quantity was stated in the specification for this…I cannot gather that any notice or consultation took place; indeed the Clerk of Works was rather ignored than consulted. 6. Extra timbers in internal walls. The same remarks apply except that this was not made the subject of a provision but a specification. 7. Concrete pugging to partitions. I am ignorant of any direction for this. 8. Extra size and height of chimney shafts. This is less open to objection than most of the former items inasmuch as drawings were given for the shafts. My complaint is that my attention was not called to these drawings …. Scott was willing to alter the appearance of the Horseshoe Cloister during the restoration, adding an extension to the north east and reinstating the onion domes on the Vicars’ Hall, which were not to everyone’s taste. However blame for the removal of so many of the original materials during the building work cannot be laid entirely at his door.